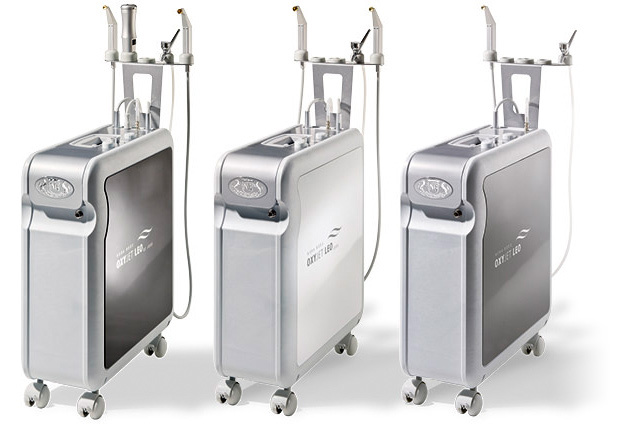 High-tech Oxygen-Modules for the perfect treatment of Face and Body without needles, gentle, effective and safe! The pulsed oxygen pressure transports the active ingredients deep into the skin using the natural interstices between the cells. The skin is not hurt during this process. Already in 1997 the internationally renowned German „Fraunhofer Institut für Biomedizinische Technik“ has tested the pulsed pressure used with the OXYJET treatment on human skin. OXYJET concentrate of active ingredients has been applied to the skin, then shot into the skin by use of different degrees of pressure. Then the skin has been examined. Following the results of these tests the OXYJET pressure has been fixed. The active ingredients penetrate deep into the skin and form a deposit there- without syringe and needles.